Our team members bring extensive professional experience in geology, biology, economics, and media production, and are ideally equipped to analyze and report on the region. All group members are accomplished outdoorspeople with extensive experience in long-distance backcountry travel. Three members are born-and-raised Alaskans and one member has traveled extensively throughout the North Slope Borough. Several team members have wilderness first aid training or first responder credentials and have EMT certification. Brett Woelber hails from Anchorage, Alaska, where he was born and raised. Brett's climbing career began in the Chugach Mountains of South Central Alaska, where his father taught him never to climb up something he couldn't climb down and always take good care of his feet. Brett's more recent climbing adventures have taken him to the Alps, the Tetons, the Andes, the Talkeetnas, the Alaska Range, and throughout the Rockies. Brett holds a particular fondness for Alaskan history and places, once hiking to the bus where Christopher McCandless died to better understand that story. His most ambitious trip consisted of traversing the length of the Tetons from Philips Canyon to Jenny Lake in one day on foot, a distance of 40 miles with 10,000 feet of elevation gain and loss. Brett is a geologist, and aims to complete his M.S. in Geology from the University of Montana by the summer of 2013. 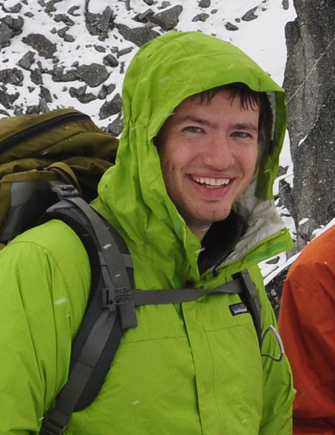 He studies hydrology and hydrogeology in the Bitterroot Mountains, analyzing how snowmelt moves through the subsurface in high elevation areas. 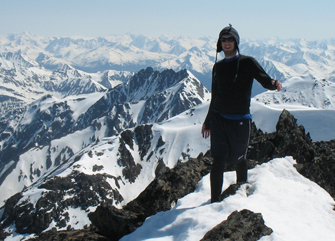 In 2011, Brett held a NSF-EPSCoR fellowship at the University of Alaska, Anchorage, where he researched spatio-temporal subsistence harvest trends in six Arctic communities. This research focused on using traditional ecological knowledge to construct maps that can be used for practical decision making. Some of the maps that Brett helped create are currently being used by Shell and the U.S. Coast Guard to inform best practices when development conflicts with traditional lifestyles. This research was recently published (2012) in the journal "Fishing People of the North: Cultures, Economies, and Management Responding to Change." 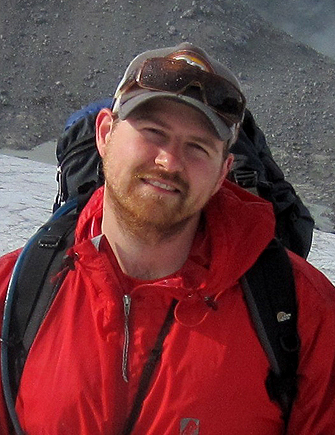 Brett was an Instructor for the Teton Science Schools in Jackson Hole, Wyoming, and brings the leadership skills he learned there to Expedition Arguk. Brett holds a W-EMT from the wilderness medicine institute. Brett also holds the distinct honor of being able to consume more freeze-dried meals on a trip than the next participant, and challenges anyone to attempt to usurp that title. "We get up at 5 a.m. to have breakfast, which means walking from one complex of Conexes (effectively a truck trailer that has some additional amenities, like insulation and windows) to the next. It's chilly out. My skin feels the ocean even though it is a few hundred miles away. We're in the flat lands - the base of the Brooks Range, a place called the Foothills - so the clouds (low enough here to be considered fog) keep us tucked in and the helicopters grounded. The plan was to leave in a few hours. That's not going to happen. We're performing biological surveys, and while we don't bill our time when grounded for weather (to a point) we can, and do, fill our time with busy work. It's not until noon that the clouds begin to release us from their nebulous embrace and recede north to the coast, thus allowing our pilots to start up the engines. The chopper gently rocks back and forth as we fly to the first data point of the day. Looking over the ineffable emptiness that is the northern coastal plain has a seemingly contrary effect of filling my head. Like the beaded streams we cruise over, my mind floods from idea to idea - places I've been, felt, experienced. The ankle-busting tussock tundra below reminds me of field work I performed in Fairbanks as an undergraduate, which takes me to the forests of south central Alaska where I grew up, and then the silent, weepy trees of the temperate rainforest. Snow-capped mountains of the Alaska Range follow, then glaciers in Wrangell-St. Elias National Park, the silt-choked rivers and streams of the Chugach National Forest, Blackstone Bay, caddisfly larvae in Cordova, cloud berries near Lake Clark National Park, willows along the Kuskokwim River. I've seen a lot of Alaska in my 29 years - both for work and play. For work, I am a Professional Wetland Scientist (certified through the Society of Wetland Scientists). This means trekking through swamps, muskegs, shrub lands, forests, tundra, the alpine, etc. Having experienced these and other ecosystem types through the critical lens of a scientist has provided me a certain perspective and awareness of my surroundings not many other adventurers in the northland can claim. It has also provided me practical experience in managing expeditions and people - the logistics of material and psychology not being an insignificant element of any trip. For play, my tastes are varied, ranging from pack rafting to mountaineering (most recently in Ecuador), backcountry skiing to sailing (most recently in Puget Sound). Such a strategy for outdoor travel has the advantage of perspective. That is, I have developed and honed skills universal to wilderness travel and survival, such as field orientation, camp (and bug) management, weather assessment, and edible plant ID. I've also picked up a number of certificates along the way, such as Wilderness Advanced First Aid, Avalanche Safety 1, and Basic Mountaineering School (through my membership and participation with the Mountaineering Club of Alaska). This inclination, experience, and perspective will be key in the success of such an intrepid expedition as Expedition Arguk." Paxson Woelber was born and raised in Anchorage, Alaska, and cut his wilderness teeth in Alaska's snow-scoured Chugach Mountains. He has thorough knowledge and experience of the Alaska backcountry, has climbed dozens of Alaskan peaks, and has carried out creative traverses through the Chugach Mountains, Talkeetna Mountains, and Denali National Park. As a professional creative director, designer, and animator, Paxson has created media for companies such as CH2M Hill, Popular Photography, Popular Science, Field and Stream, the campaigns of the current Governor and Lieutenant Governor of Alaska, and a group of high-end Napa wineries. He has provided social media management, consulting, and design, and TV animation to political campaigns and organizations. Paxson's creative animation's have won first place in the Ivy Film Festival and Best of the Fest at the Anchorage International Film Festival, and he was the subject of a full-page profile in Popular Mechanics magazine. His animation "Reflection" went viral on YouTube, earning over 1.6 million views and 5,000 comments. His outdoor photography has been published in Backpacker magazine, has received approximately half a million views on Flickr, and has been featured on LinkedIn and dozens of blogs. He is a frequent contributor to Wikipedia, and has written articles and submitted photos for many of Alaska's landmarks. As Expedition Arguk's Media Manager, Paxson brings extensive experience in Alaska's wilderness, strong traditional and new media expertise, and a record of creating unique and popular artwork, photography, and animation into the backcountry. 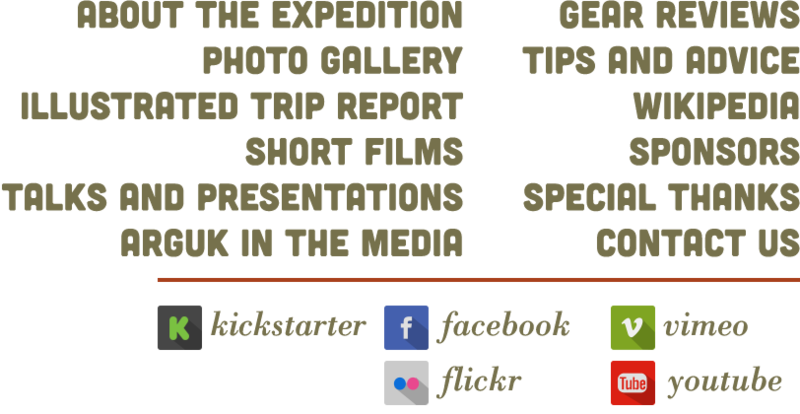 Most notably, he will be in charge of creating an animation of the trip, which will be promoted online and sent to outdoor film festivals around the world. Paxson has a BA from Middlebury College and a Post-Bacc certificate from the San Francisco Art Institute. His hobbies include cooking, reading, writing, and time travel. Combine endurance and adventure, and you'll have an event that Chelsea is sure to love. Her family has been trekking in the Alps, running marathons and ultramarathons, hiking through misty nights in Scotland, embarking on backcountry excursions in the American northeast and west, and competing in Ironman triathlons for many decades. After recently winning the female division of a three-day ultramarathon running event (1st day: 50k, 2nd day: 50 mile, 3rd day: half marathon) in the rugged central Appalachians and with plans for several ultra-races in the works, Chelsea is continuing the family tradition. 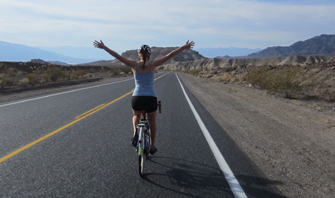 No stranger to extended trips either, she helped organize and completed a 5,100 mile bike across the southern US in the spring of 2012. Chelsea's inaugural backcountry experience included two multi-week trips into the Clearwater Mountains of central Idaho on a geologic mapping project. She currently satisfies her need for time in the great outdoors with running, biking, hiking, and skiing while living in Missoula, MT, where she teaches preschool children. One of several Middlebury College graduates on the team, she majored in Geology and minored in Environmental Studies, and is a Wilderness First Responder. She spends her spare time romping in the mountains with her chocolate lab and making delicious food. Luke is an experienced and adventurous outdoorsman, taking delight in learning new disciplines—there are few ways to move around in the outdoors that he hasn't tried. 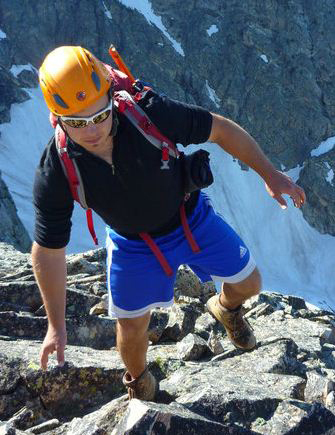 He brings extensive experience hiking and climbing in the Northeast of the United States, climbing Mt. Monadnock as a little kid, adventuring with Outward Bound as a teenager, and working as an outdoor orientation guide at Middlebury College leading trips in hiking, climbing, skiing, and snowshoeing. Some of the sillier trips he has undertaken include a 30 mile hike along the train tracks from Middlebury, VT to Burlington, VT and a 28 mile, 8000 foot of vertical one-day sprint along all the summits of the Mount Washington range in New Hampshire. He has skied the Rockies, the Green and White Mountains, and the French Alps. He also brings a deep knowledge of water travel both above and below the surface as a sailing and windsurfing instructor and collegiate racer as well as certified SCUBA diver. Luke has extensive adventure experience outside the United States, hiking in places as diverse as Cappadocia, Turkey; the Kakshaal-Too range in Kyrgyzstan, the foothills of Nepal, and in Java, Indonesia. He is the trip's cultural liaison, using the social expertise taken from his development work in impact investing and social enterprise to document socioeconomic changes in the trip area. He holds a B.A from Middlebury College in International Politics and Economics, is AIARE Avalanche Level 1 certified, and has a collection of first aid training ranging from Wilderness First Aid to Oceanfront Lifeguarding.